My husband created his own concoction using Fresca instead of the seltzer water, which is also very good. Mint makes a great garnish for a little extra flavor. 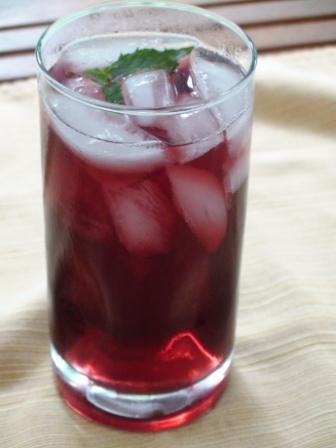 *Research has shown that Concord grape juice has many of the same flavonoids (antioxidants) as red wine, cocoa, tea and berries. It has also been shown to have a very high antioxidant activity compared to other juices. So I can get many of the same health benefits of red wine without the alcohol. Welch’s makes a Concord grape and Black Cherry juice that is also delicious. *I use an orange juice with added calcium and vitamin D for an extra nutrition boost. Vitamin C is of course great for the immune system, which needs all the help it can get during pregnancy. Fortunately I haven’t suffered from nausea in this pregnancy, but ginger ale can be soothing for those who do. Thai basil makes a nice garnish and adds a little of a spicy kick. Staying hydrated is very important during pregnancy. 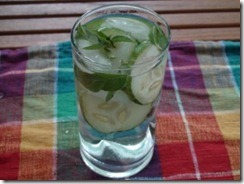 This is a very refreshing way to drink water! I have an abundance of both cucumbers and Thai basil in our garden, so this is a fun way to use it. 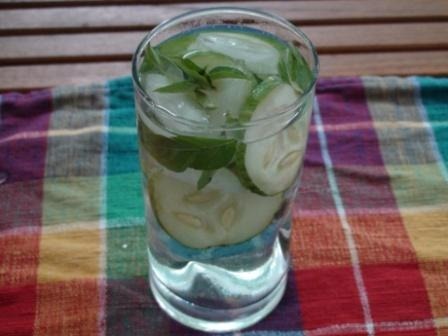 Cucumber really transforms water into a special treat. 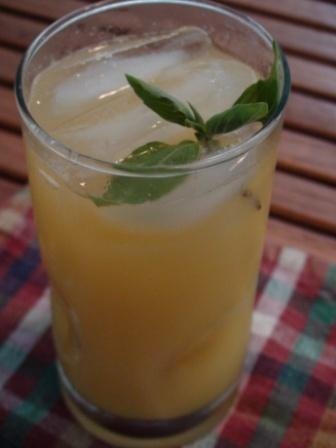 The Thai basil gives it a little bit of a peppery kick. Mint is also a good substitute if you don’t have any Thai basil. What are your favorite mocktails?